MOPL's Billing Solution is a totally customized solution that fully focuses on your requirements. It provides comprehensive solutions including some parts of practice management also, which in turn helps you to focus on the quality of care you provide to your patients and maximize your revenues. It eliminates redundancies and unleashes efficiencies and savings that we pass along to our customers. Since we understand that every facility has unique needs and requirements, we provide customized solutions devised after thoroughly exploring your needs. Our Billing Solution helps you to choose all or a few from the services listed below as per your requirements. If desired, our office works just as an extension to your office to handle patient calls and schedule the appointments for you. One of our billing software's scheduler* is arguably the best patient scheduling systems in the market and helps you to fully optimize your most precious resource - your time. It is integrated with essential patient details including alert memos for outstanding balances, co-payment amounts & checkout, and referral information, which invariably enables timely collection of dues and increases your cash flow. Also, the scheduler's integration with charge posting prevents any revenue loss on account of missed charges. Research shows that ineligibility accounts for a larger percentage of the denied claims, and serving patients without verifying insurance is often detrimental to the cash flow of any practice. Our eligibility check marks out ineligible patients and helps you to eliminate could-be bad debts beforehand and ensures that you are paid for all the time you put in to serve your patients. One of the most important tools of revenue generation is correct ICD, CPT, and HCPCS coding. Our experienced and certified coders correctly code all the procedures and supplies along with their corresponding diagnoses by using most updated coding books and coding softwares and ensure you are paid fully for all the services you provide. Outsourcing your billing services to MOPL helps you to utilize the 12-hour time difference between US and India and ensures that your charges are Billed on the Same Day of rendering the services, thereby ensuring faster payments. Sending clean and accurate claims is the key to any practice's revenue cycle optimization. Our claim scrubber* scrubs your claims before submitting to the insurances and the claims goes through more than 3.5 million edits for CCI, HIPAA, LMRP, and carrier-specific problems. This reduces rejected medical claims below 5% guaranteed. MOPL's Billing-At-Ease solution sends electronic claims to thousands of payers and receives and reviews electronic claim processing reports leading to faster reimbursements. In a few specific cases where payers do not accept electronic claims or requires paper attachments, you can elect to have these claims automatically printed and mailed by us, thus saving you from the hassles of arranging for postage and printing. In addition, if your medical transcription needs are taken care of by us, we send all the required documents with claims, in turn freeing your staff from looking for documents. Our Billing-At-Ease solution enables you to receive an electronic remittance* transaction that can be reviewed in the software and automatically post payments by procedure. Automatic posting of this data improves accuracy and results in rapid patient statement processing. For insurances that do not remit electronically, the payments are posted manually and EOBs stored for further reference. With the usage of the most updated coding books and coding softwares, our experienced and certified coders and the tough claim scrubber* that scrubs your claims before submitting to the insurances through more than 3.5 million edits for CCI, HIPAA, LMRP, and carrier-specific problems, the denials are reduced to less than 5%. These reduced denials are again scrutinized by our experienced claims team that works tooth and nail to get your each penny paid by the insurances. If needed, they utilize each appeal process to ensure that no part of your hard-earned money is stuck with the insurance companies. Sending patient statements might be a bulky and costly process for you but is essential in improving your cash flow and reducing patient outstanding. Therefore, if you elect, the paper statements can be generated by us and mailed to patients directly saving you from the hassle of stamps, stationery, envelopes, printing, sorting, stuffing and addressing and not to mention the manpower required for that. Our robust billing process including eligibility verification, correct coding, timely billing, rigorous patient & insurance follow-up and state-of-the-art denial management invariably enables timely collection of dues. In addition, our experienced Accounts Receivable team rigorously follows all unpaid claims after each insurance's minimum claim adjudication period and ensures that you have least days in accounts receivable, thus optimizing your revenue cycle and increasing your cash flow. If your medical transcription needs are taken care of by us, we send all the consultation reports to the referring physicians enabling you to keep them updated about their patients' health status in time, ensuring healthy relationships between you and them, in turn generating more referrals to you. The success of any medical practice is directly proportional to the satisfaction of its patients, whether it is from the services provided by you or from the efficiency by which your staff handles their billing queries. Our office just works as an extension to your office and our AR team, trained in customer relationship management, handles your patients' queries to their satisfaction. We provide physicians and practices with complete credentialing and contracting services with all insurance carriers and networks. The process usually takes from 90-180 days. We assume full responsibility for the entire process including creation of letters of interest on your behalf, completion of contracting paperwork and follow up with the insurances. We also keep a track of your re-contracting needs, which in turn frees you and you assistants from the worries of remembering the expiry dates and following up with the insurances for the same. 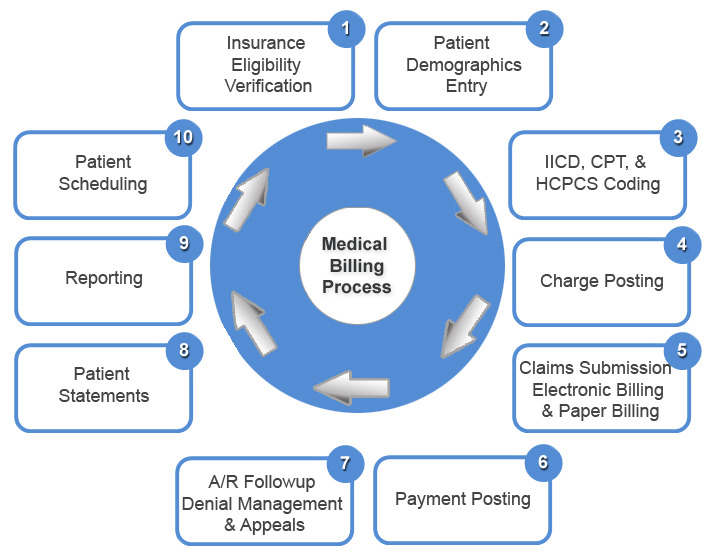 How the Medical Billing & Coding system works and what are steps involved? Many Problems - One Solution!!!... Macro Outsourcing Pvt. Ltd. There are many compelling reasons why outsourcing your medical billing needs to a professional medical billing and coding company makes sense. Medical Billing Specialists' Employee benefits, taxes (federal, FICA, unemployment, etc. ), and workers' compensation insurance. Limited access to experienced coders/professionals. Some of these are typically overlooked when calculating the true cost of in-house billing. Comparing to these true costs generally makes a strong case for outsourcing medical transcription with cost savings typically estimated to be in the 20-40% range. Click here to see more benefits of outsourcing to MOPL. Benefit from time zone advantages. Concentrate more on your core business. Take patient care to the next step with our faster deliveries. Stay immune to high employee turnover levels. STOP worrying about rising employee costs. STOP worrying about your accounts receivables. Billing staff's tendency towards concentration on current claims after numerous attempts to recover older claims have failed. Continued depreciation of old claims. Delayed insurance and patient payments. Rising internal recovery costs and practice expenses. Continued restriction of cash flow. Utilizing Six Sigma techniques, we guarantee same day Charge Posting, Insurance Billing, and Payment Posting, which in turn ensures revenue cycle optimization. Our process of error-free billing reduces denials to less than 5%. Our trained and experienced AR Staff follows through each pending and denied claim rigorously, to include all required appeals, until full payment has been obtained. With our varied experience across various practices, regions, and specialties, we might be of support to you to identify and eliminate problem areas in your practice management and thus reduce expenses, increase cash flow, and optimize your revenues. HIPAA compliant security for patient and financial data. Access to a talented pool of professionals. No major IT restructuring, training, or investment required. No set up fees at our end.